Have you always wanted to have straighter teeth? If you were to rate your smile on a scale of 1 to 10, would 9 or 10 be your honest answer? At Brooks Dental we can help you reach your perfect smile with Invisalign wireless metal free braces. The average treatment time is 8 months and your friends and co-workers will be unaware that you are straightening your teeth. They are comfortable, do not affect your speech, and can be removed when brushing your teeth or eating at your favorite restaurant. 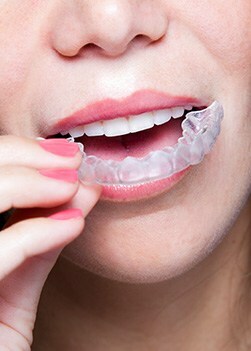 While straightening with Invisalign you will receive free home whitening. Call Brooks Dental today to schedule your free smile evaluation. Why Choose Brooks Dental for Invisalign® Clear Braces? Invisalign, an orthodontic treatment approved by the FDA, is the virtually invisible method to straighten your teeth without conventional metal braces. With Invisalign, a custom-molded set of transparent, removable aligners will progressively reposition your teeth. You can simply remove the aligners before eating, brushing, flossing, or special occasions. This technology is more comfortable and convenient that traditional braces. Patients do not experience the mouth abrasions caused by metal and wires, and Invisalign aligners are easy to clean. Adjustment appointments aren't necessary, either. How does Invisalign work? First, we use 3-D computer imaging to design a comprehensive treatment plan. This allows you to preview the final positioning of your teeth before you start treatment. Yes, you will see your future smile before treatment begins. Then a lab will create a series of aligners to reposition your teeth over one to two years. You'll change aligners every two weeks until your smile is straight and beautiful. Typically, you will visit us every six weeks for progress reports. Transparent, removable, no-hassle orthodontia. Now that should put a smile on your face!